When Will I Get My SAT Scores? 5, 4, 3, 2, 1. PENCILS DOWN! How was I supposed to calculate that tricky math problem? What did that vocabulary word mean? Truth is, you probably won’t know the answers to any of these questions, at least not for a while. But in the meantime, you’re anxious to find out how you did on the test! When will scores come out? What should you do if you’re unhappy with your score? Have no fear! We’ve got all the answers. So… when will I get my SAT scores? The availability of your test score depends on your testing date. However, scores typically go out anywhere between 16-20 days after the testing date. When did you take your SAT? Collegeboard lists their score release dates by testing date on their website. Click here to find out when your scores come out! 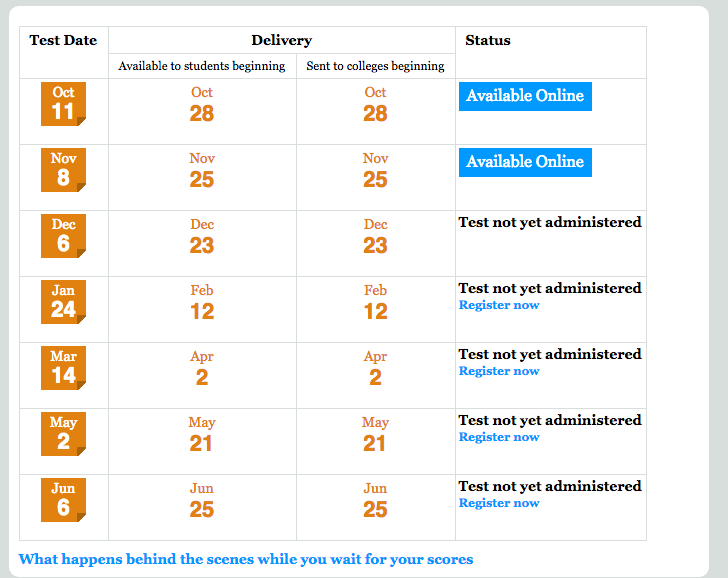 Or, if you’d like, you can use this screenshot of Collegeboard’s helpful SAT score timeline. 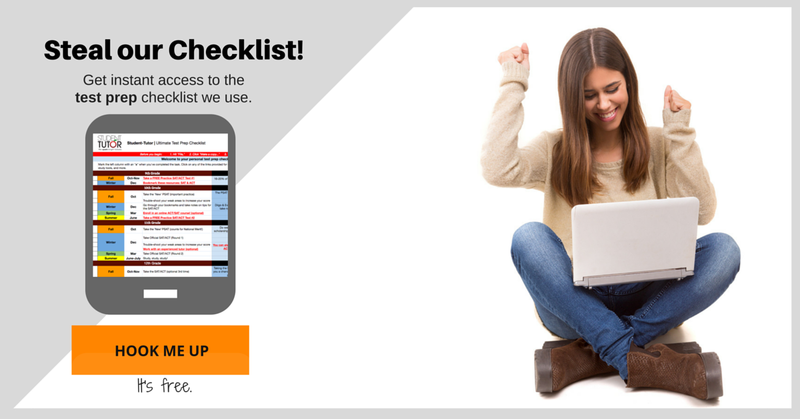 And while we’re on the subject of timelines and the SAT… you may want to go ahead and grab our FREE Test Prep Checklist — get instant access to helpful links, deadlines, and check off Test Prep to-do’s from your phone or computer. After 16-20 days of anticipation, waiting and worrying, your SAT scores have finally come out and…unfortunately, you didn’t get the score you were hoping for. Don’t sweat it! It’s not the end of the world! If you didn’t get the score you wanted, maybe you just need to rethink your study strategy. or maybe even hiring your own personal SAT tutor! But let’s say you’re really displeased with your score…so much so that you demand to know where you lost points and why. Or, let’s say you’re studying for a future test, and you want to know what went wrong the first time. That’s where the SAT Question-and-Answer Service comes in! 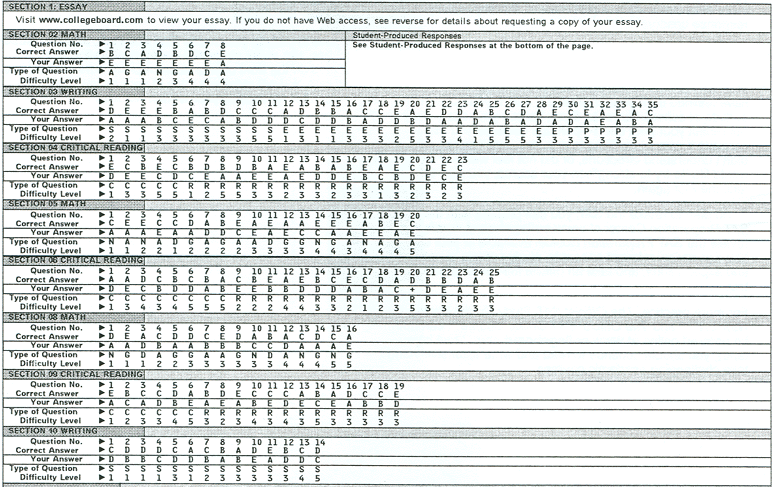 Notice that the report lists both the student’s answers and the correct answers. The SAT Question-and-Answer Service is extremely helpful to those who wish to double-check their answers to make sure that their test was scored accurately and fairly. In addition, by going over your mistakes, you will be much less likely to make those same mistakes on future SATs, should you decide to take the test again. When is the Question-and-Answer Service available? In short, if you’re in U.S. or Canadian test centers, the Question-and-Answer Service is available in October and January, for students taking the test on a Saturday. Then you can only get the Question-and-Answer Service in May. When is is not available? You should also note that the Question-and-Answer Service isn’t ALWAYS available to students in every testing session. If you’re taking the test when QAS isn’t offered, you should order Student Answer Service, another student answer verification service that Collegeboard offers. BUT WAIT! This is very different from the Question-and-Answer Service because actual test questions and answers are not included in the service. If you order QAS while you’re registering for the SAT, materials are typically mailed two to three weeks after scores are released. IMPORTANT! If you plan to use these materials to study, they might not get to you until after the next scheduled test date! So make sure you don’t plan on taking the very next available SAT test. You can order online by visiting My SAT and selecting Order Verification within My Scores. You may call Customer Service at 866-756-7346 (US and Canada) and 212-713-7789 (International). You can also order by downloading and submitting the SAT Answer Verification Services Order Form. Make sure you don’t wait too long! Remember, you only have 5 months from the time of your test date to order your SAT Question-and-Answer Service, and you should keep in mind that after ordering the service, it can take a couple weeks for your order to process. So, basically, plan ahead! And, if possible, just order the service along with your registration so that you can still retake the SAT it in time if you need to. SAT scores typically come out 16-20 days after testing dates. If you’re unhappy with your score, you can have access to your test questions and answers through the SAT Question-and-Answer Service (QAS). QAS is only available to students taking the SAT on certain test dates. If QAS is unavailable, the Student Answer Service should be available. Just to be on the safe side, you should order your QAS upon registering for the SAT—you never know what might happen! Remember that even if you receive a low SAT score, it really isn’t the end of the world. You can always take the SAT again, and you can utilize the Question-and-Answer Service to pinpoint areas in which you need help. Did you perform as well as you’d hoped on the SAT? Share in the comments below!